A single home run in the ninth inning by the Coast Guard Academy was not enough for them to prevail in the second game of their series against Wheaton College’s baseball team. 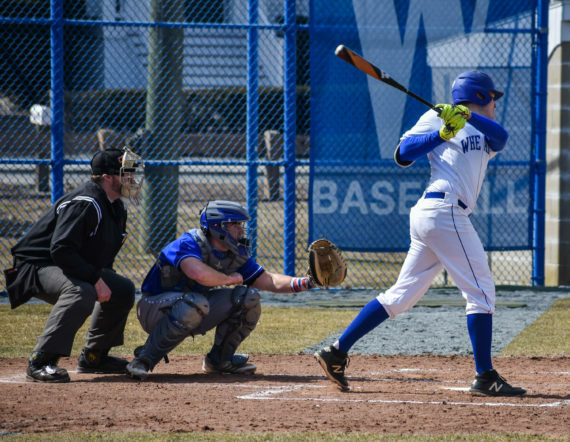 In this two-game series, Wheaton’s 10-3 baseball team was able to outplay and outlast the Coast Guard Academy as they outscored them 5-0 in the first game, and later in the day beating them once again 9-1. Wheaton Baseball. Photo by Caroline Chaffiotte. This two-game series played on March 24 were the first games of the season to be planned within the NEWMAC conference by Wheaton College. These two games have tied Wheaton with Babson in the NEWMAC standings. Although Rabson has a better overall record statistically, they have won the same amount of interconference games. Springfield, another divisional rival, also has two division wins but has an overall record of 6-6. This early into interconference play it would be hard to predict which team will come out on top with over a dozen conference games left to play. But it can be said that these early victories have put Wheaton in a good position as they move forward.